For geologic topics: contact Paul Jewell (coordinator of the Utah Geological Association volunteer speakers) at 801-581-6636. For rocks & minerals: contact R.O.C.K. club (Rockhounder’s Outreach for Community Knowledge), rockhoundersock@yahoo.com. Rock, mineral, and fossil; grade 4 (can also be used for grades 2 [rocks], and 8 and 9 [extinction]). Ice Age; grades 4, 8, and 9 (includes extinction and climate change). Kits are available at the UGS for a refundable deposit. Call 801-537-3300 to reserve. Click here for more kit information. 5th-grade landforms and geologic processes (volcanoes, earthquakes, uplift, weathering, erosion, deposition): contact Mike Hylland (UGS) at 801-537-3300. 5th-grade landforms and geologic processes: contact Mike Hylland (UGS) at 801-537-3300. Ice Age presentation (ppt); Grades 4, 8, and 9; Ice Age climate, geology, and animals. Landforms presentation (ppt); Grade 5; volcanoes, earthquakes, uplift, weathering, and erosion reshape Earth’s surface. Grades 2, 4, 5, 8, and 9; rocks, minerals, earthquakes, volcanoes, Utah geologic history: contact UGS Information and Outreach Program at 801-537-3300. Grades K-12; earthquake hazards, risks, safety, and preparedness: contact Bob Carey (DEM) 801-538-3400. Grades K-12; earthquakes (all topics); contact UUSS at 801-581-6274. Grades K-12; traveling photo display, current earthquake activity, maps, activities, earthquake safety, and other resources: contact UUSS at 801-581-6274. Grades 5-12; landform teaching kit, maps, other information: contact UGS Information and Outreach Program at 801-537-3300. Grades K-12; earthquake safety/preparedness: contact DEM at 801-538-3400. The UGS employs approximately 50 geologists, paleontologists, and hydrogeologists. The UGS operates the Natural Resources Map & Bookstore, which sells topographic, geologic, and other maps; natural resource publications, posters, and brochures. Free items are also available. Teacher workshops (5th-grade in 2006) in cooperation with UUSS and OES. Activities (grades 4, 5, 8). Slide sets and PowerPoint presentations (grades 4-8). Maps, materials, and other information (K-12). Field trips (for teachers of all grades). The UUSS is on the University of Utah campus and part of the Department of Geology and Geophysics. The UUSS monitors and studies earthquake activity in Utah, Yellowstone National Park, and the Intermountain West. In 1994 the UUSS formed an “Earthquake Education Partnership” with the University of Utah’s College of Mines and Earth Sciences, OES, UGS, the American Red Cross, and the University of Utah’s Department of Geography to develop Utah-specific earthquake curricula for grades 3, 5, 7, 8, and 9. A traveling photographic exhibit “Earthquakes in the Intermountain West.” The stand-alone multipanel display can be delivered to your school at no cost for one to three weeks. Rapid information and maps for current earthquake activity. Information on historical earthquakes in Utah (photos, newspaper articles, personal accounts). The DEM is responsible to plan for, respond to, recover from, and mitigate emergencies and disasters, and coordinates emergency management efforts among federal, state, and local governments. DEM prepares individuals and communities for disasters through outreach and training programs. Classroom speakers on earthquake hazards, risks, safety, and preparedness. Brochures and information on preparedness for earthquakes and other hazards. Student grants (grades 5-12) for seismic safety projects (contact Bob Carey, 801-538-3400). 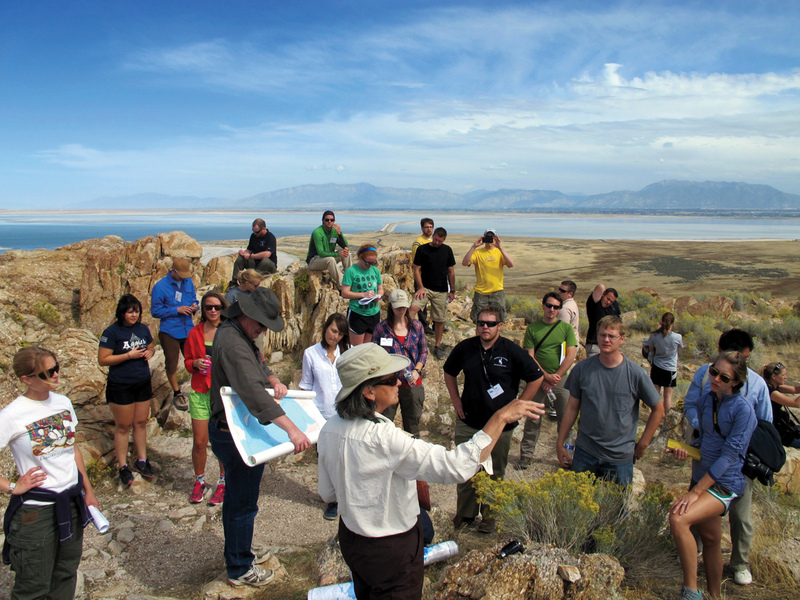 ESE was formed in 1993 to provide outdoor-based workshops for teachers focusing on hands-on, inquiry-based learning at different places in Salt Lake County and on Antelope Island in Davis County. Led by Genevieve Atwood, former State Geologist of Utah, the workshops are geared to Utah’s science core curriculum topics. Although grade levels that match core topics are indicated below, ESE opens their workshops to all K-12 teachers. Rocks and Minerals of Salt Lake County (grades 2 and 4). Salt Lake County’s Changing Surface (grade 5). Geologic History of Salt Lake County (grades 4 and 9). Antelope Island: Evidence of Climate Change (water cycle: grade 4, earth systems: grade 9). ESE also instructs teachers about their school’s walkable, backyard geology.